Abi knows the drill by now. At least once every couple of months, her mother and I pack up a bunch of clothes and electronics and other stuff we’ve outgrown, load the boxes into the car and drive down to the local Goodwill donation center. At 5 years old, Abi still giggles at the ding-ding of the driveway bell as we pull into the unloading area. But recently our arrival at the loading zone triggered a different response from the back seat. My wife and I exchanged a glance of incredulity and stifled a laugh. We turned to gently correct our daughter. Overlooking the criminal accusation, we told her we were only giving away things we no longer used (no toys were packed up… this time). Then we reminded her why we were there. We’re lucky, we told her. We have lots of things other families don’t have. This is our way of giving back. As any parent knows, this is just part of a larger mission, along with nudging our child to give grandma a hug after receiving a lollipop or cuing up the “What do we say?” refrain when the checkout clerk issues an offhand compliment about her Wonder Woman T-shirt. We try to raise grateful kids because we don’t want brats who grow into entitled adolescents and self-centered young adults. We do it, perhaps subconsciously, because we know we grown-ups also need an occasional reminder to assess and be thankful for what we have. We want to be better people and be surrounded by better people. Emmons is founder and director of the Emmons Lab at UC Davis, where he and his team are at the forefront of a growing body of research that provides hard data to back up the philosophy that gratitude can improve our health. Through various practices, such as having people keep daily journals of gifts and graces, Emmons and his colleagues have observed a wide range of psychological and physical benefits, ranging from lowering blood pressure and cholesterol to reducing anxiety and the risk of depression. Other researchers point out that expressing gratefulness also improves interpersonal connections—all from just taking a minute or two to stop and say “thank you” to a co-worker who helped you in a bind or a friend who baked you cupcakes. Sure—but how does it work? How does a diary of blessings or a “thx!” text function as such a cure-all? Although the physiological science behind the connection is still a bit murky, Emmons says that from a behavioral and psychological standpoint, gratitude heals simply by overcoming and blocking out the general negativity that causes the stress from which so many maladies stem. Having an overall focus on the positive triggers the parasympathetic part of the nervous system that eases stress. In fact, research at UC Davis has linked gratitude with a 23 percent decrease in levels of cortisol, the stress hormone. That relief alone can have far-reaching health benefits. For instance, in one Emmons study, subjects who kept a gratitude diary for two weeks showed a sustained 28 percent reduction in perceived stress and a 16 percent drop in perceived depression. The UC Davis study also showed that two activities—counting blessings and penning thank-you letters—reduced the risk of depression in at-risk patients by 41 percent over six months. Subjects keeping journals took in less dietary fat by as much as 25 percent, and grateful respondents’ Hemoglobin A1c, a marker for diabetes, dipped by between 9 and 13 percent. 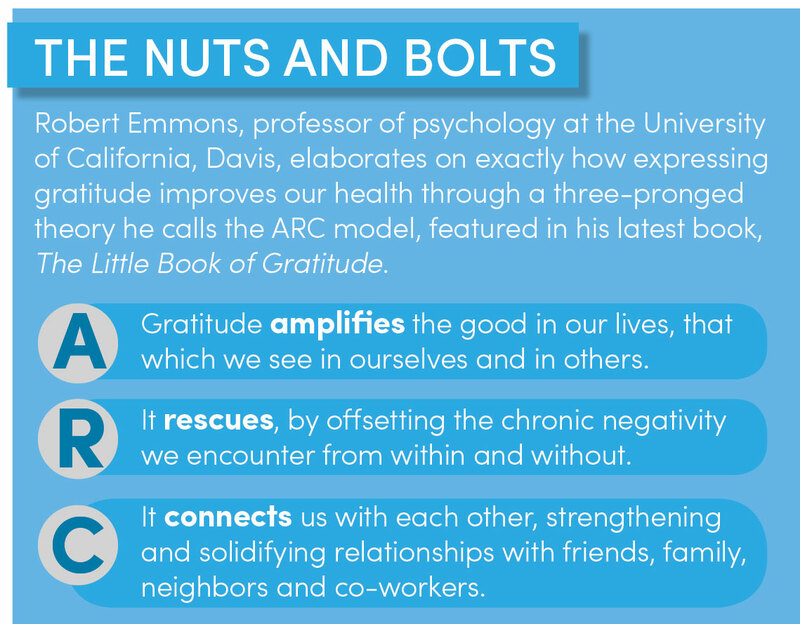 Emmons and his colleagues at UC Davis are not alone in their quest to discover why expressing gratitude makes us healthier. A paper published by faculty at the University of Kentucky and the University of Louisville observed that overworked law students who had optimistic outlooks—which have been linked to gratitude—showed heightened immune systems. UC Davis studies have shown that grateful hearts have 16 percent lower diastolic blood pressure and 10 percent better systolic numbers. Mills, who specializes in disease process, says he doesn’t really know exactly how being thankful kick-starts our hearts. The bulk of these studies deal with the internal perks of a grateful attitude. But in order to get the maximum benefit, we have to do more than think about gratitude and jot it down in our private journals. After all, what good is a thank-you note if it’s never sent? “Gratitude requires empathy, it tunes you into the goals of another so that you can be more supportive of their efforts and sensitive to their needs,” says Giacomo Bono, assistant professor of cognitive and applied psychology at California State University, Dominguez Hills. He says that helping others puts you in a better position to help yourself. “We don’t achieve things without taking chances,” Bono says. “We have to put ourselves out there, and a lot of times, we might not do that on our own. But if you have one or two good colleagues who are supportive of your efforts, then you’re more likely to take a chance. 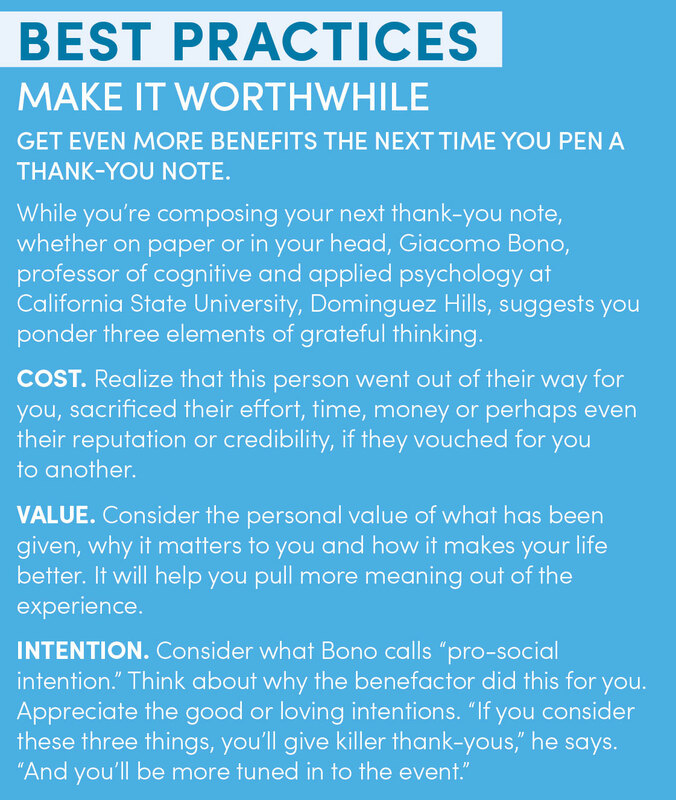 And without taking that chance, you’ll never know your capacity.” Bono points out that this give-and-take is the foundation for all of our social and business networks because expressing gratitude is key in developing trust. Bono has done a lot of work in observing and teaching gratitude to children. But he says the beauty of this psychological and physical salve is that even if your parents or teachers didn’t drill it into you as a kid, you can pick it up any time. For anyone looking to tap into the healing power of thankfulness, he recommends keeping a journal or a list of people, places and things you’re grateful for. This will serve as a daily reminder to be on the lookout for the positive. Also try to express your gratitude more regularly by saying “thank you,” or even giving a fist bump or a high five, if it’s appropriate. Whether you’re penning a note on personalized stationery, scribbling in a journal or just meditating, a deep contemplation of gratitude will probably be a tune-up for your mind and body in many ways—including some we might not yet even know. Meanwhile, back home, Abi is probably too young for journaling or letter writing, beyond a quick note. But maybe we’ll start sitting down on a regular basis and making a list of our blessings. Along with prompting empty, muttered “thank yous,” we’ll take a second or two afterward to dig beneath the autopilot politeness and mine the true reason she should be appreciative. And the next time we make a Goodwill run, maybe it’ll be time for us to give Abi an empty box and ask her to choose the toys and books she feels she can part with—items she thinks some other girl or boy might enjoy. To focus on what she has, what we all have as a family, and why some of these things might be more valuable to others. We know it will be a hard lesson. But hopefully, one day, she’ll thank us.